With the addition of Hotel SB Glow (4* sup. ), the chain now offers 1,492 rooms, of which 75% are located in Barcelona and represent the perfect mix between leisure and business segments. 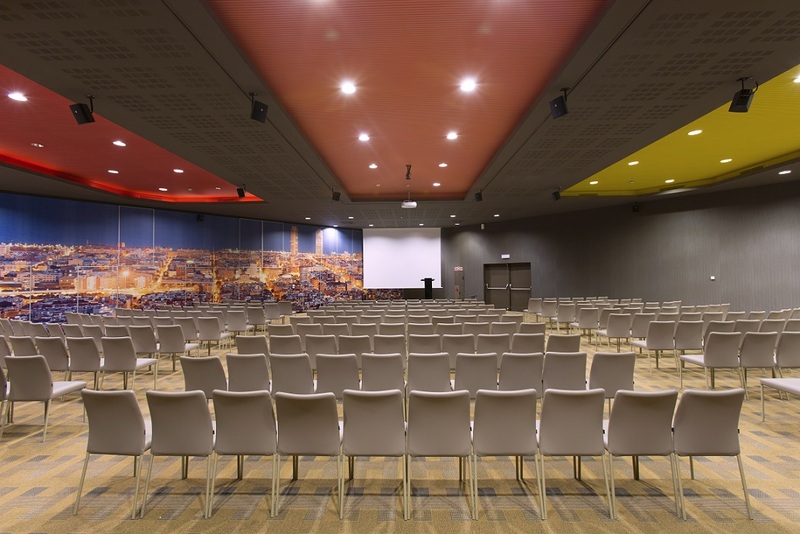 With over 3,800 m2 of indoor space available for events in Barcelona, all hotels in the chain offer totally open-plan modular function rooms without columns. These rooms, which have a minimum height of 4.5 metres, boast natural light and cutting-edge technology. Another of the chain’s most strategic hotels in Barcelona is the Hotel SB Diagonal Zero (4* sup.). Just a short walk from the marina and right opposite the CCIB international convention centre, this hotel is perfect both for its first-class facilities and the location it enjoys. In total, it offers 800 m2 of indoor spaces for events, all with a height of 5 metres, which is somewhat unusual in the different venues around the city. Its seven panelled rooms and foyer with natural light, all located on the first floor, are perfectly equipped for any type of event. As in all hotels in the chain, this establishment has its own restaurant, the ECHO Healthy Restaurant, with executive menus and different options for group menus, catering and banquets. Another factor that makes this hotel unique is ‘The 15th Lounge’, a floor with private access, lounge and terrace. 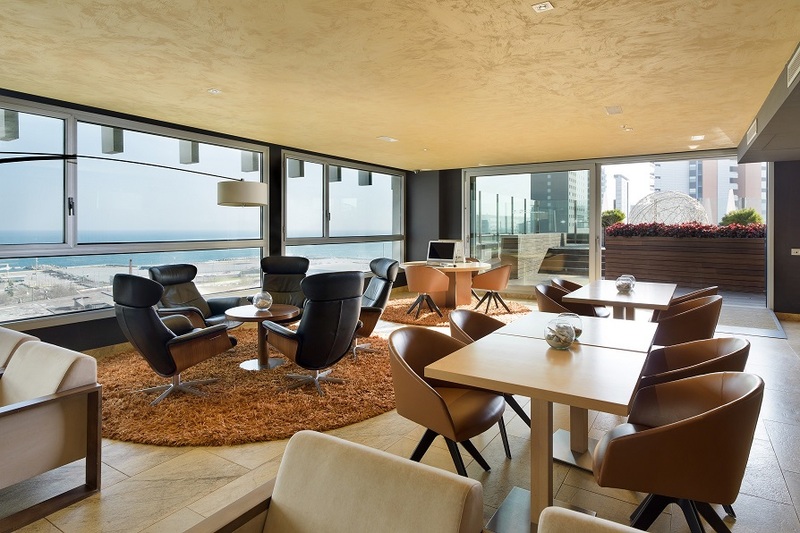 This lounge not only lets you enjoy magnificent views of the city and the Mediterranean Sea, it is also ideal for holding small meetings in a relaxed environment. There are sofas, work tables, a catering service and international publications available for users of the lounge. Highlighting some of the hotel’s outdoor spaces, there is a magnificent garden terrace on the ground floor that allows us to offer a restaurant service in a relaxed and chilled atmosphere. And you will certainly never forget the panoramic pool with pool-bar service, a stunning space for our most discerning clients. 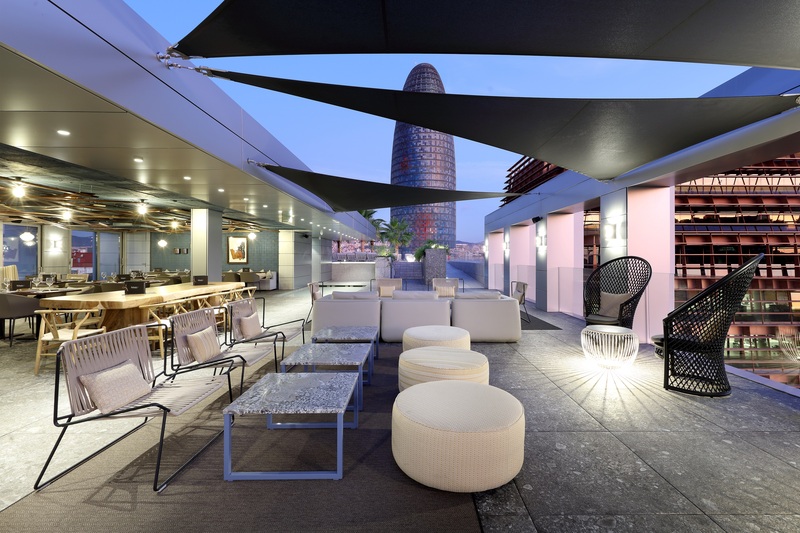 Finally, in the heart of Barcelona’s innovation district and just a few steps away from the famous Torre Glòries, designed by the architect Jean Nouvel, is the Hotel SB Glow (4* sup.). This hotel is the newest partner in the chain, and as its name suggest, the Hotel SB Glow was born to shine. With the very latest in interior design and a firm commitment to high-end aesthetics and furnishings, this hotel is setting the trend in an area of the city where it shares space with top-level technology companies. The Hotel SB Glow offers different indoor and outdoor spaces with a maximum capacity for 300 people. More specifically, there are seven modular rooms measuring up to 370 m2 that can be arranged to suit the client’s requirements. The rooms are connected to two vertical gardens of over 5 metres high, imbuing events with all the freshness and Mediterranean light that they are worthy of. The Garden Room deserves a special mention here. It offers direct access to the terrace and enjoys an independent entrance from the outside. Another incredible space in the hotel is its magnificent large foyer, boasting a customisable 4-metre LED screen and a spectacular spiral staircase designed exclusively for this hotel. 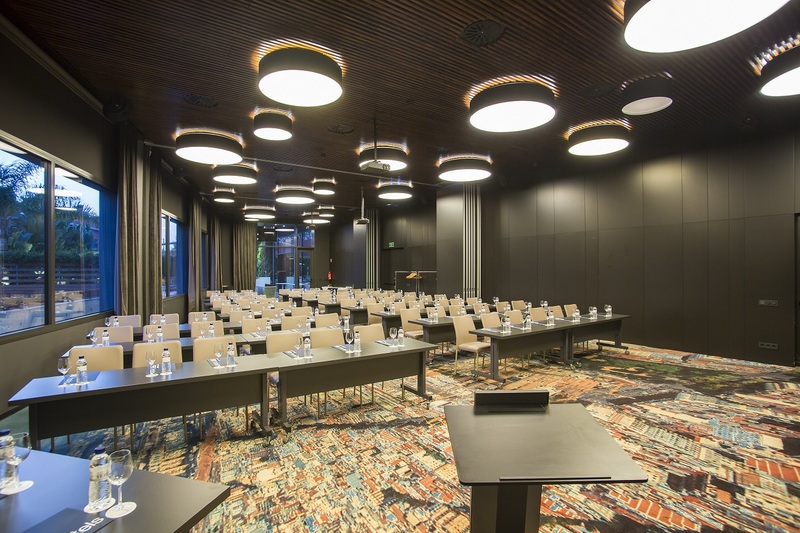 The Hotel SB Glow also has different restaurants: at street-level is MUC Restaurant, an exclusive Mediterranean chargrill restaurant with a reserved area and all the technology you need to hold your meeting whilst enjoying genuine Mediterranean flavours. Another option is to hold your event on the impressive terrace of Panoramic Food & Drink Pool – Voladís on the top floor of the building. It boasts magnificent views of the city, a panoramic outdoor pool and a restaurant area where you can enjoy cocktails, sushi and other gourmet dishes. At 34 metres up, this is undoubtedly the hotel’s most iconic space. If you seek to make an impact in the centre of Barcelona and want to be just metres away from the city’s best beaches, the ideal option is the Hotel SB Icaria (4*). The hotel has been recently renovated, and the common spaces and rooms have been restyled, positioning the hotel with an even higher standard of quality. Boasting 900 m2 of outdoor and indoor spaces for events, the hotel has recently opened a new restaurant dedicated to Mediterranean cooking, LO Restaurant, which gives direct access to the terrace and pool. This terrace, measuring 317 m2, allows coffee breaks and aperitifs to be offered in the open air in a warm environment with an emphasis on design. The recently refurbished hotel also has a private space, known as the Vanity Room, with direct access from the street, an exit onto the hotel terrace, its own bar, sound booth and restaurant service. With five panelled rooms measuring 4.75 metres high and a large foyer, the hotel has a sound booth, allowing organisers to host events that require simultaneous translation. In short, Hotel SB Icaria offers a wide range of possibilities to make your events a success throughout the year. Due to its proximity to the airport, the Hotel SB Plaza Europa (4*) is also notable. This hotel is the perfect choice for guests who require accommodation close to the Fira Gran Vía, as its location, a few metres from the trade fair, makes it the benchmark hotel in the area. The Hotel SB Plaza Europa has over 350 m2 of indoor spaces for events, a restaurant with a terrace, a garden area that is perfect for a cocktail party or outdoor coffee break and a 500 m2 rooftop with panoramic pool and catering service on request. Venues like the Hotel SB BCN Events (4* sup. 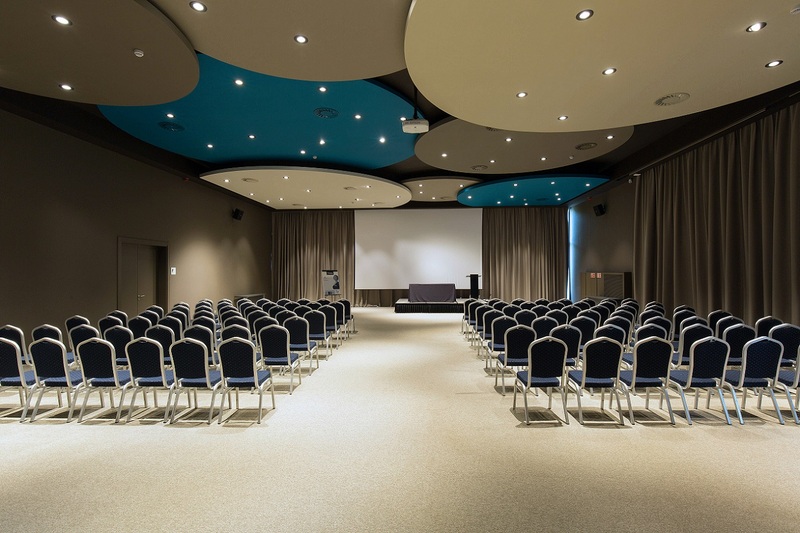 ), just 10 minutes by car from the airport and with the capacity to host events for up to 400 people, stand out from the crowd as they are very practical when it comes to organising meetings in the different function rooms which simultaneously offer different formats. This hotel also has large and pleasant outdoor spaces, such as the garden terrace which allows us to accompany any event right next to the hotel pool with our own catering service. Our restaurant service also provides added value, and the eSBo Restaurant team has devised a wide range of menus that can be customised depending on the client’s needs.